Android is making its move to reclaim market share lost over the holidays as it jumps to 61%, a big jump over the 49% recorded in the fourth quarter of 2011. One the flip side, iOS dropped down to 29% market share, down from close to 41% it held during the last quarter of 2011. Apple’s typical holiday surges are a result of heavy demand for the iPhone 4S as customers rush to grab Apple’s newest smartphone during the holiday season. Given the release of todays numbers, Android has crawled its way to the same market share numbers it held during the third quarter of 2011. As it stands now, Apple and Android now hold 90% of total smartphone market sales in the U.S. However, smartphones themselves failed to grab any further traction as a percentage of total mobile phone sales grabbing just 66% of all handset sales in the last quarter of 2011. As we look at the total smartphone market, Android continues to stay the US smartphone king with 48% total market share against Apple’s 32%. Hmm why is iOS share rapidly declining after the iPhone4S release? I guess people are realizing that it’s pretty much the same 2010 phone and are jumping to Android for something a little more refreshing. …and poor WP7, I can’t even tell if you have a percentage. 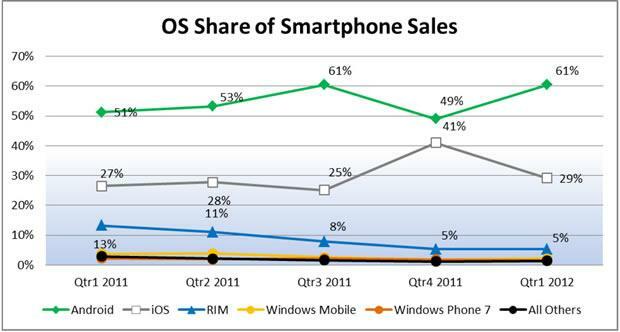 That graph shows the sales for that quarter and not the overall share of people who have which device. So the drop looks huge for iOS and the jump looks huge for Android, but the overall share is pretty much just status quo between the 2. I think there is going to be a big jump when iPhone 5 comes out (as all the apple fans camp out for hopes of getting their hands on it early). Just like there was a big jump when the Iphone 4S comes out but it still won’t outsell Android. Which is fine, no single Android phone matches the sales of the iPhone. You have to take into consideration, Apple isn’t exactly competing in the low end market where Android is doing extremely well. Considering nearly 75 cents out of every dollar made on handsets is going to Apple, that graph doesn’t hurt them in the least. Android is competing in the smartphone market bringing everyone into the new age of smartphone, apple is just putting out the same thing as last year with a bigger cost just because they know their name just holds a fan base that will sucker into it. The iP5 is gonna sell RIDICULOUS numbers if they go with a 4″ screen. Otherwise, it’s just another 3.5″ iPhone but with a Quad-Core processor maybe. They would be STUPID not to go 4″ finally. It’s sad, but WP7 is one the smoothest OS’s out. Not very many issues, just needs more support from the Dev’s. Also, iOS, has become outdated, and the people using it are looking to leave. (David, cough, cough, cough) Seriously though, it is outdated…and those using it are the people that were using an older model. I agree. I was skeptical about WP from the beginning, but I’ve been hearing so many things about the OS. Slick and smooth, great battery life, just needs more apps written for it. Yup, WP is very smooth. If the UI could be customized, I’d consider switching. I, for one, welcome our Google overlords. Rocking a flashed LG G2x. Hold on. The iPhone was over 80% of AT&T’s smartphone sales and more than 50% of bothe Sprint and Verizon’s smartphone sales last quarter according to their earnings reports. Those three carriers control a huge percentage of the market. I don’t see how these numbers can work out mathematically. Sprint, VZW, and ATT are not the only carriers in the nation. There are many others like TMO, US Cellular, Cricket, Metro PCS, Smart Mobile, Walmart Family Wireless, and many others. none of which sell the iphone. chose to report their new smartphone purchase, therefore, this information does not necessarily reflect the total smartphone sales in the US. Anytime reports like this are give, some data should be provided showing the information gathering process, such as an internet poll may give different results than actual sales results. Just saying (I use Android, so way to go Android). I’m just annoyed by supposed facts everywhere online that offer no supporting information. – no offense David.